Mark your car with the leading brand in high performance with the ROUSH Floormats. The floormats feature the "ROUSH" logo and are made from high-quality materials. The mats feature polypropylene fibers for their strength, comfort, color appearance, and resistance to stains, mildew, abrasion, and sunlight. The fibers are coated with styrene-butadiene (SBR) for even more resistance to abrasion. 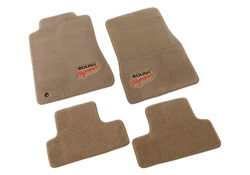 These ROUSH Floormats include four mats: left and right of both front and rear. The driver side mat features a 10mm diameter brass ring to accomodate the driver side mat hook. The mats fit 2005-2009 Ford Mustangs and are tan. ROUSH floormats are also available in black (part #401355) and black with red edges (part #401357).